Backup! The word sounds really safe whenever we are dealing with computers or other gadgets. It is basically a preventive measure what all the sensible users take if they are concerned about the data stored in their hard drives. There are many who still say this: What is the need of creating a backup and occupying space unnecessarily? Why we need a BKF file Recovery Tool? So, first I would like to answer them why do they need to backup their data. Why should You Create a Backup in Windows? I’ll keep it short and simple to understand, read it calmly. Say you came back from a Las Vegas trip with your friends, of course you must have had really good memories captured in images and videos. All the multimedia files are now stored in your computer. Few days later, you check your folder and all the files stored in your folder are inaccessible. Reason? of course you don’t know. So, if you had performed a backup of your files, it was nothing to worry about. This is why, every individual should perform a backup. I shared a couple of articles on PDF repair and Archive recovery. There I provided a trusted solution to repair corrupted PDF file and corrupted archive file. But you might not need these solutions if you already have a backup of your files with you. If you are dealing with a large Access Database, you may fix errors in Access by following few steps. I am surely going to tell you about how we can repair and restore bkf file in windows, but let us recall and know how to create a data backup in Windows 8.1, 8, 7 or XP. Also if you are an SQL database administrator, you should know about the backup and restore process of database as well. In both the scenarios, the backup file created is in the form of .bkf file. How to Create Backup in Windows 8.1/7/XP? Backup data using NTBackup Utility: It is a built-in utility in MS Windows OS which is installed with the OS package. Using this windows backup tool, you can backup all the data present in your hard disk is a single backup file (.bkf file). Backup data using Backup Exec: BE utility is another windows backup tool introduced by Symantec (Veritas). It is a commercialware tool which gives many other options at the time of backup operation. For MS SQL Server Administrators, you may perform a complete database backup by following the steps mentioned on this page by Microsoft. You can use any of the tools mentioned above to create a backup of your computer data. The backup file created by all these methods will be in .bkf format. Now that you have taken your backup, you must be thinking that now my data is safe. What would you do if your backup itself is corrupted? And when we say corruption, that means the backup is inaccessible and cannot be restored. Well scratching your head won’t make any difference, but before proceeding to the solution to repair .bkf file, you need to know the reason behind it. Virus infection: Virus infection is the most common reason for BKF corruption. It damages the backup file silently and we come to know about it when we are trying to restore backup. It is followed by two other major reasons, which is improper shutdown or power outage, and hard disk crash. Interrupted backup Operation: During the backup operation is going on, any soft of sudden interruption can led to the corruption. Missing of catalog file: Catalog file can be easily understood as an index file of .bkf file. If any of the catalog files go missing, you may not be able to restore BKF file. CRC failed: It is basically a Cyclic Redundancy Check error which can be seen if there is any issue or malfunction in the BKF file. The backup file becomes inaccessible in such issues. Error in backup application: Say if the backup utility you are using is have any error which is not shown during the backup operation, the backup created at that time will give errors during the restore process and your need to repair the BKF file. 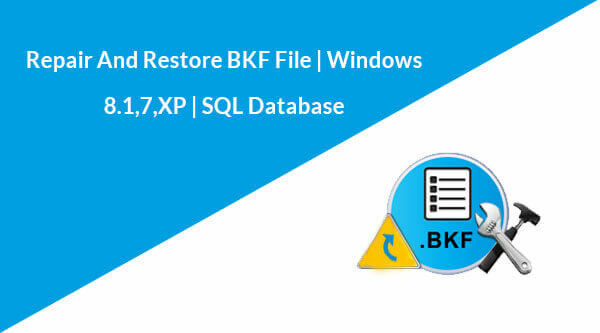 So now, either you have a windows data BKF file created by NTBackup or BE, or you have created your SQL database backup, a single tool can help you repair and restore your corrupt or damaged bkf file. There is no reliable manual technique that can be used to repair these backups. Therefore I don’t want you to waste your time on trying unsuccessful methods. I can suggest you to go with a BKF file Recovery Tool by SysInfoTools. This tool is capable to resolve errors from a Windows backup file and SQL database backup as well. Whereas if you simply require a solution to repair Windows BKF file, you can go with a windows backup recovery tool and restore your files. If you have any query or doubt, you may drop it in the comment section below.